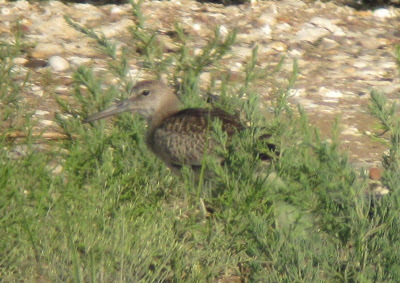 While birding Sandy Pt on Saturday afternoon, a juvenile Western Willet was present among five or so juvenile Eastern Willets (the local adult Easterns seem to have departed). I was able to grab a few decent images of both subspecies. Separation of Western (inornatus) from Eastern (semipalmatus) Willet is something that is being attempted more and more lately, and it is very doable especially when both subspecies are present side-by-side. 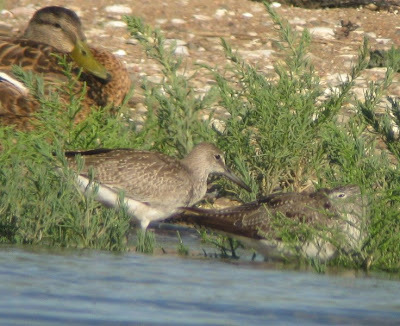 Someday these two subspecies may be split into full species, so it would be outstanding to get a head start on identifying every Willet we see. 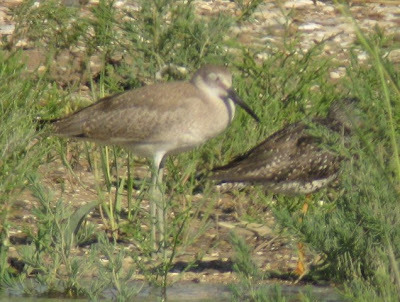 Note the long legs, size much larger than the adjacent Greater Yellowlegs, bill shape, grayish coloration, and the degree of contrast between the scaps and coverts. 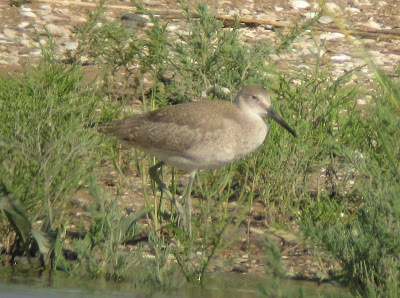 That is one big, lanky, pale willet. 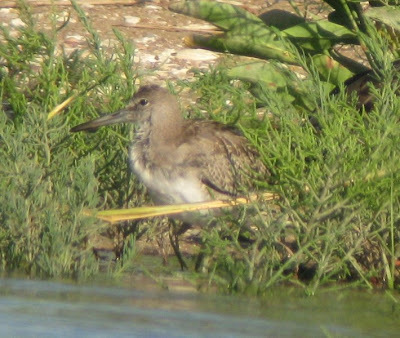 This photo shows the darker/browner coloration, shorter stature (but tough to see with all that vegetation), and thicker bill. Here you can get a feel for the bird's smaller size as compared to a Greater Yellowlegs; it is just a bit larger than the GRYE. You can also appreciate the greater contrast between scaps and coverts. A different angle of the bill, and another view of the darker scapulars and how they contrast more with the paler wing coverts. 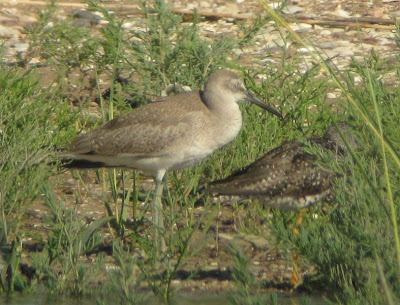 If I can get more/better images of these willets in the coming days, I will update this post. If you'd like you can email photos to me. Click on my profile in the right column, then click on "Email" in the left column.